The Lastrada company prepared a comprehensive catering service in terms of the 25th anniversary of Nicromet, organized by our company. We’ve worked together for more than half a year, coming up with a menu made to fit the client. 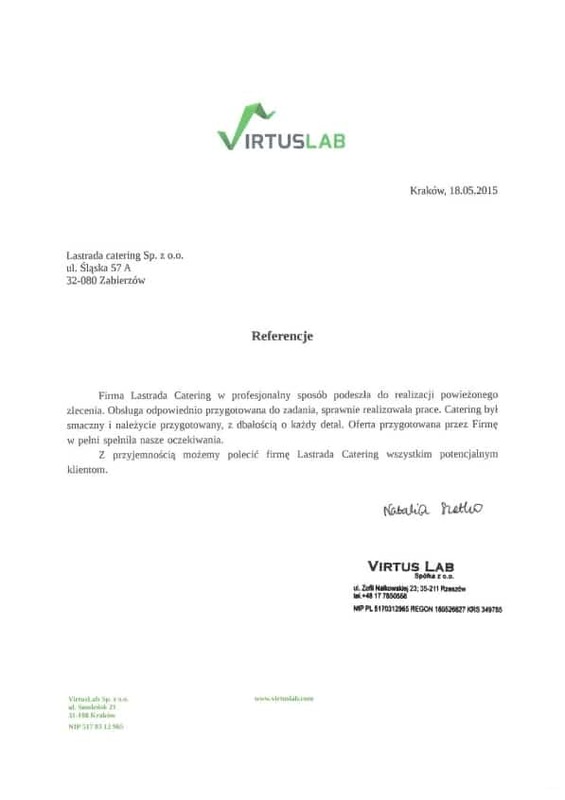 The Mineral and Energy Economy Research Institute of the Polish Academy of Sciences states that Lastrada Catering Sp. 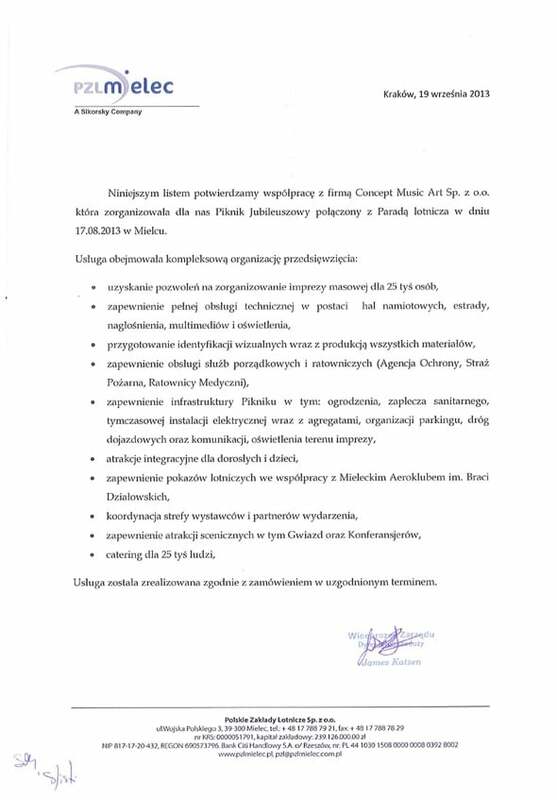 z o. o. has provided gastronomic services for the purposes of conducting the XXV Szkoły Eksploatacji Podziemnej conference on 25.02.2016 at the Słowacki Theatre in Kraków, for nearly 300 people. The Lastrada Catering Sp. z o. o. company has been responsible for handling the catering services during an international medical conference which was held at the Słowacki Theatre in Kraków on 20-21.11.2014. 450 doctors from various countries all over the world participated in the conference. I wish to provide references for Lastrada Catering Sp. z o.o. 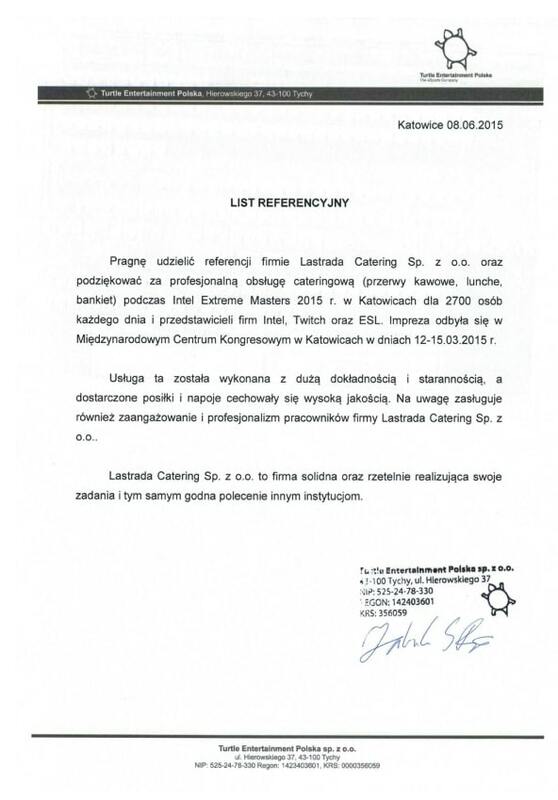 and thank for the professional catering service (coffee breaks, lunches, banquets) during Intel Extreme Masters 2015 in Katowice for 2700 people each day, and the representatives of Intel, Twitch, and ESL. The event took place at the International Congress Center in Katowice on 12-15.03.2015. Lastrada Catering approached the commissioned task in a professional manner. The staff was properly prepared for the task and efficiently executed the works. The catering was tasty and properly prepared, with care for the smallest details. The offer prepared by the company fully met our expectations. 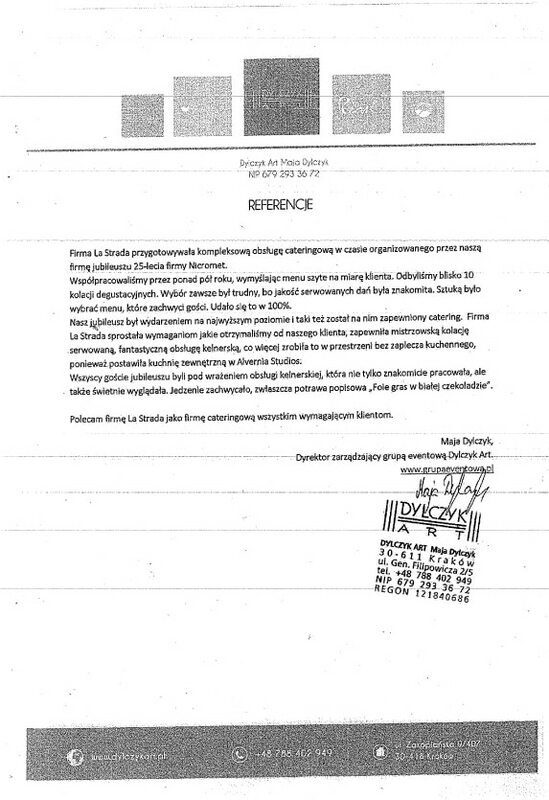 With this letter we confirm working with the Concept Musie Art Sp. z o.o. company which organized an Anniversary Picnic for us combined with an Air Parade on 17.08.2013 in Mielec. It is my great pleasure to recommend the services of Lastrada Catering ul. Śląska 57 a 32-080 Zabierzów, to its following clients who are looking for the best service and an individual approach to the client.